We woke up to a cloudy day, our first morning in Grindelwald. We were up pretty early as obviously our body clocks were still on Indian Standard Time, 3.5 hours ahead of local time. And we had to be in time to catch our train to Jungfraujoch! We proceeded for an early breakfast. The scrambled eggs were awesome with delicious local ham, crispy bacon and pork sausages. I took a moment sampling a variety of local cheese, I was warned by the waitress that local Grindelwald cheese was quite sharp for most people, but I quite liked it. A variety of breads were on offer - white, multigrain and rye. Both of us enjoyed rye bread, a classic German bread with a bit of butter! Our excursion today took us to Jungfraujoch. We exchanged our booking vouchers at Grindelwald station for tickets to Jungfraujoch - Top Of Europe. We spent a few moments enjoying the crisp mountain air as we waited for our train to Kleine Schiedegg from where we were to board a cogwheel train that would take us right to Jungfraujoch. From Grindelwals's altitude of 1031 metres, the train took us to Kleine Schiedegg at an altitude of 2061 metres and on the way our train passed by stations of Grindelwald Grund, Brandegg and Alpiglen. On the way, we passed by beautiful high altitude pastures and remote but beautiful chalets. Across the aisle, a local guide and two Korean men were sitting. She mentioned that a few hundred years back, Grindelwald was a just a small glacier hamlet, but as global warming happened, the glaciers receded to the upper reaches of the Eiger-Jungfrau ranges. We overheard her tell the Koreans that the locals were quite poor a few hundred years back until the British came exploring and developing resorts and sanatoriums in such remote Alpine villages across Switzerland. For accessibility, they started work on railways. The government fearing British dominance over the locals stepped up developmental work and restricted British activities. She went on prescribe appropriate sunscreens for up there at Jungfrau and how Vitamin D is important for the bones. Hearing her I felt we in India have really ignored this aspect - in fact it is indeed ironic that Saudi Arabia and India, despite being the sunniest countries in the world, have the highest degree of Vitamin D deficiency, and this lifestyle disease is reaching epidemic proportions. At Kleine Schiedegg we changed trains - we shifted to the Jungfraubahn - a cog wheel railway that took us into the upper reaches of the snowclad Alps. As a little kid, I had read about the cog wheel rails and was incredibly fascinated with the way the train runs. Today, after nearly 3 decades I finally travelled on one. 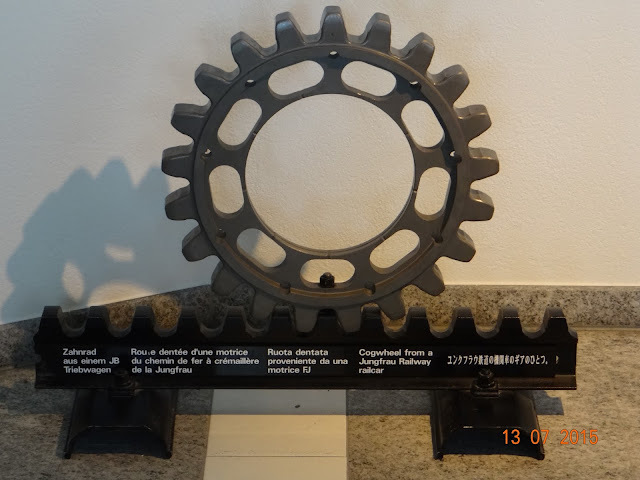 The geared cogs help the train get up and down the steep mountain slopes in a controlled fashion. We passed by quaint stations of Eigergletscher, Eigerwand and Eismeer to reach Jungfraujoch at an altitude of 3454 metres. On the train we met two interesting Sri Lankan couples, one of them had a cute little daughter who ended up playing hide and seek with us. The Sri Lankan couples were from Vancouver, Canada and were traveling back home from Sri Lanka and vacationing in Europe on the way. They were incredibly fascinated by India and hoped they could visit Agra for the Taj Mahal and Sarnath in Varanasi, the birthplace of Lord Buddha! We took tips on the must visit places in Interlaken from them as our train rolled into Jungfraujoch.